45 Comments As an Amazon Associate I earn from qualifying purchases. 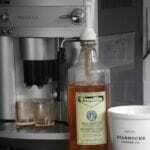 Ever wonder how to make your own Starbuck’s vanilla syrup? 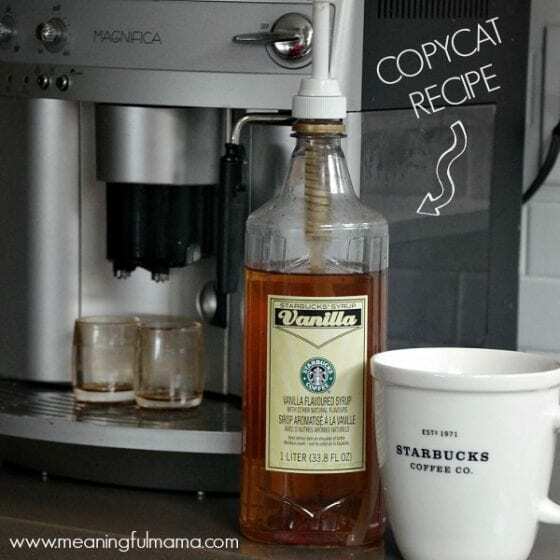 This copycat Starbuck’s vanilla syrup recipe is so easy, takes minutes and costs pennies to make. Once you have this recipe in your back pocket, you will never want to purchase vanilla syrup again. 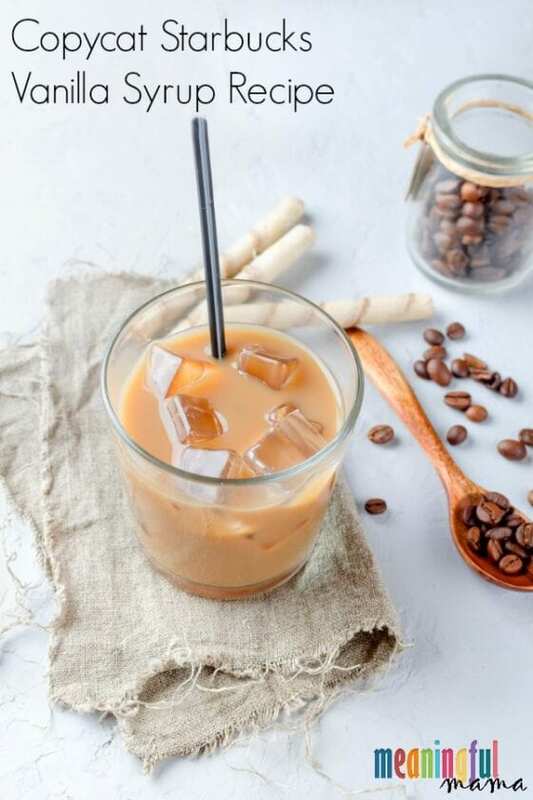 Whether you want to flavor your espresso drink or your black coffee, this recipe adds just that touch of sweetness to break the acidity you often taste in coffee. Boil the water and add the sugar, stirring until dissolved. Remove from heat (very important), and add the vanilla (I do a heaping tsp). Cool completely before adding the vanilla syrup to your pump container. It will melt the bottle and shrink it if you don’t let it cool. Note: We always double this to fill our pump container 2/3 of the way up. Looking for a recipe that shows how to make a sugar-free vanilla syrup? Why not try this version at Health Starts in the Kitchen. I must confess an addiction. I am sure many of you can relate. Coffee. I wasn’t a coffee drinker until I met my husband. My husband and I met at church. After that, he made sure our mutual friend planned an event we would both be at. That night we began to get to know one another. The next event that he got himself invited to was my birthday celebration. When the evening was wrapping up, he walked me to my car. “I like hot chocolate,” I replied. During our dating relationship, he introduced me to the fact that coffee can be made to taste sweet. Who knew? I have been a grande vanilla latte girl ever since. OK – Maybe I did know coffee could be made sweet. After all, I have found much delight in my Kahlua pie with coffee whipped cream. Being born, raised and residing in the Seattle area, it only make sense that I follow the culture here and fall in love with coffee. Drinking coffee is a relational thing around here. In England, you will gather at the local pub for a pint. Italy? Relationships are built around wine. In China, people bond around tea. For Seattlites, it is coffee. A number of years back, we realized that as a couple who each visited Starbucks daily. Eek. We also realized we could save a lot of money buying our own espresso machine .We haven’t looked back. I can’t imagine how much money we have saved. I discovered we could save even more money if I learned to make my own vanilla syrup. It was so easy. I was sold. You will be thrilled with the money you save too. We used to buy this Starbuck’s brand of syrup . Over $25? Eek. What I would do is buy it once. Then, you have the container that you can re-fill with with your own homemade vanilla syrup. My husband has a very particular pallet and can taste nuances that I cannot detect at all. He says there’s no taste difference in this concoction and the one you would buy at Starbucks. I believe him. Do you know how much cheaper this version is to make? It’s a simple 1-1-1 ratio. 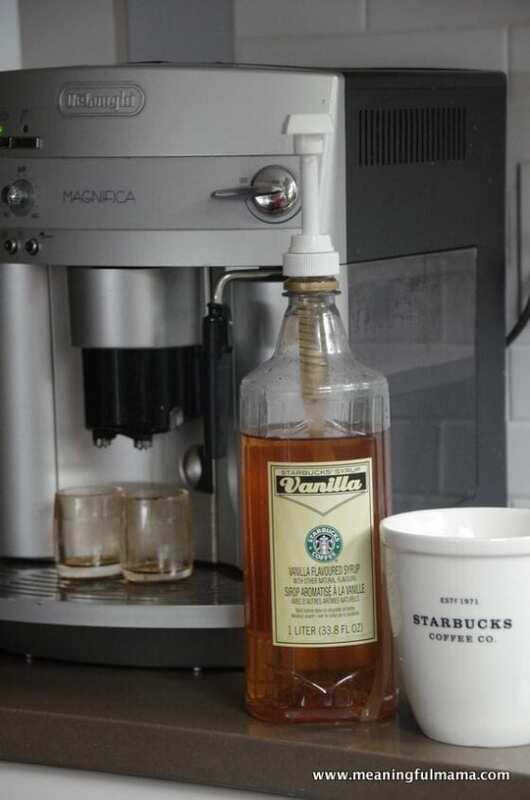 This copycat Starbucks vanilla syrup recipe is easy to make while also being affordable and tasty. Cool completely before adding the vanilla syrup to your pump container. It will melt the bottle and shrink it if you don't let it cool. Note: We always double this to fill our pump container 2/3 of the way up. 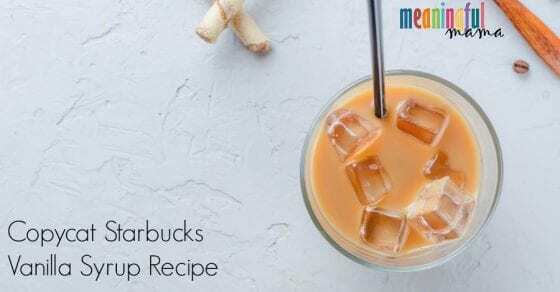 Need Breakfast Ideas to Serve with Your DIY Starbucks Vanilla Latte? Note: This post was originally written in 2012. I have learned a lot about blogging since that time. 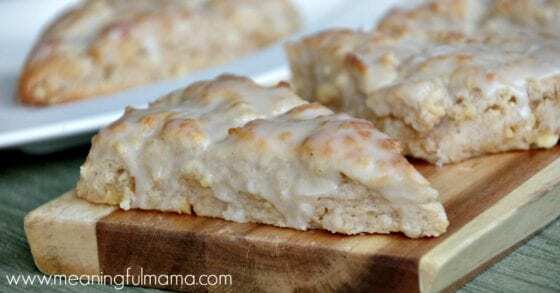 Therefore, I have kept the recipe the same, but taken the opportunity to update this post with new pictures and a more friendly reader format. It was re-published in October of 2018. Jodi – thanks for sharing! So easy – can’t wait to add it to my coffee tomorrow morning! can’t wait to try it! do you use it in lieu of sugar and where can i find a pump bottle like that. any other suggestions of a kind of bottle? Hello, Jane! Yes, you can use it in lieu of sugar. I bought the bottle originally from Starbucks because I used to just use their vanilla syrup. You can find flavoring like this at a number of coffee stores. The pump we purchased from a store here called “Cash and Carry.” I saw these online http://www.ebay.com/itm/281082399586?hlp=false&var=. Just type in pump for Starbucks vanilla syrup to see your options. It does not need to be refrigerated. I just keep it stored on my counter.Enjoy! i forgot to ask if it needs to be refrigerated afterwards? heya does it stay runny or go thick like a syrup i made this recipe and its watery is it meant to be like that? It’s not as thick as a syrup but it is not as runny as water. I would say the consistency is a bit more watery than syrupy. Did you like the taste? I put my syrup in a newer style washed ketchup bottle. It works fantastic! The recipe was great! I surprised my wife with it one day when she walked in from a bad day at work! Nice! I love that you surprised your wife with it to lift her spirits! Way to be a good hubby! Great idea with the ketchup bottle too! When you put vanilla, do you mean vanilla extract? Yes. Sorry that wasn’t clear. Man – I have no idea. I tried using the baking stevia once, and I wasn’t a big fan. That said, I’m just not used to the artificial sweetener taste. I just followed the directions for the proper ratio. Sorry I’m not more help! Made this for my sis with a mock peppermint mocha that I also made. She thought I’d gone out to starbucks just for her to get her mocha with vanilla syrup. She even paid me the money for it! How long does this last? Thanks! I keep it in a Starbuck’s pump container, and it lasts a long time. I’m not sure how long. I would say to make 1 cup water, 1 cup sugar, 1 tsp vanilla at a time to see how quickly you use it up. We have lattes daily at our house and make the 2:2:2 ratio without a problem. Enjoy! I came onto here because I was wondering what the particular kind of vanilla Starbucks uses. I was concerned because vanilla production may or may not be vegan. Interesting. Let me know what you find out! Thank you so much for this recipe. I went to Starbucks yesterday (after a long absence from coffee; 3 years) and they said it would cost $12.95; I was shocked!! The last time I purchased it was $7.95; all I could think of was I wish my cost of living raise was that ratio!! 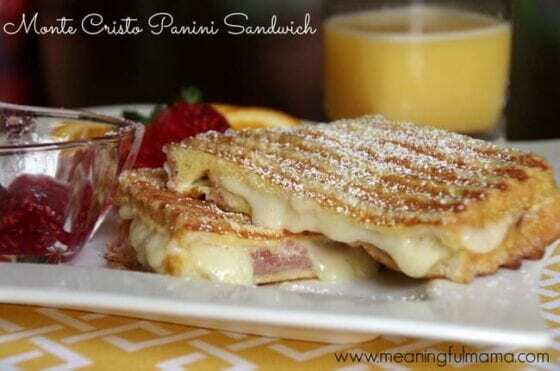 I will make this today. Again, thank you. So glad it was helpful. It really is ridiculous how much it costs. I just made some yesterday. I don’t think you’ll be disappointed. Actually, it tastes better than Starbucks! Perhaps it’s because I use Spice Islands Pure Vanilla Extract, which uses Bourbon Vanilla Bean extractives and alcohol. (Just don’t get too fond of it!) By the way, using powdered sugar distills easily in the boiling water. Jodi Durr for President! LOL – So glad it was a winner for you. We love it too. I’m without a kitchen right now, and my sugar and vanilla is packed away. I can’t stand to go to Starbucks and pay $12. I think I need to run to a friend’s house to make some. Thanks for commenting! 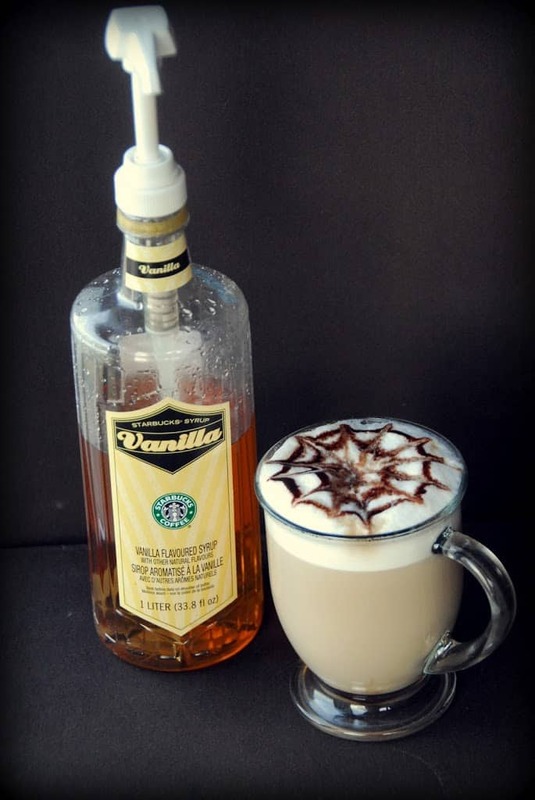 I used to buy the Starbucks vanilla syrup at Barnes and Noble until they stopped selling it. It was $10. Starbucks charges 13 or 14, so I bought one bottle and have rationed it carefully. As a result, it has lasted over 4 months. But if this make-your-own recipe works, I can stop the rationing! Thanks for the tip. I don’t think you’ll be disappointed. I can’t spend that kind of money now that I know how easy it is. Enjoy! Well, I’m not disappointed. Worked like a charm. Thanks again. Fabulous report. So glad you like it. You’ll be saving yourself a lot of money! 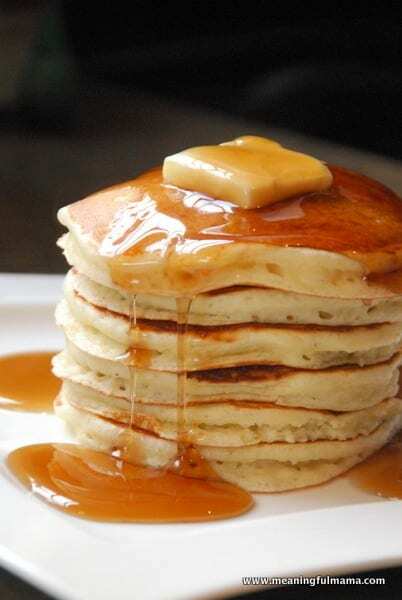 Hi, I am so happy and grateful you posted this recipe for all of us vanilla syrup lovers. I am going to follow your recipe and make my own like you did. I am almost out of my Starbucks vanilla, and I am thinking (as you said) that it will taste just as good as SBs’ vanilla syrup. I tried the SB brand on my finger, and it does have what I would think is the same taste that would seem similar to your recipe. I do have one question though. Do we have to refrigerate the syrup that we make? I was hoping we didn’t have to, just like I don’t refrigerate with Starbucks’ vanilla. Then again, SB probably uses preservatives so that we don’t need to keep it cold. Hello! I’m so glad you are excited to find the recipe. There is no need to refrigerate it. We just use the SB pump. That said, we do make 2 lattes a day (one for me and one for my husband), so we use it up fairly quickly. If you are concerned, you could half the recipe. Do check back to let me know what you think. I’m glad I get to save you some money! Oh, goodie. I’m happy that I don’t have to refrigerate it. I just finished making it 5 minutes ago. It’s perfect…and I am glad I will save money because I go through this stuff fast. 🙂 Thanks for everything!! I’m sure lots of people would love to know this nice little secret. Hello! I thought I would share something since I got this wonderful idea and recipe from you. Well, with me being in a hurry one day, I decided to microwave my water and sugar. This option does work; however, I make sure that I stir my sugar and water several times while it is heating. I bring it to a good boil in the microwave and then take it out. Stirring is very important if you do go this method. I have done this twice now, and this 2nd one seems to be better since I did stir it more. So this worked out pretty well as long as I stir. I do still prefer heating the way you told me, but I wouldn’t hesitate to use the microwave if you are having one of those days where you need to make this faster than usual. However, I have to laugh now about my big mistake and wanted to share this, too. I’m sure you ladies are a lot brighter than I am when it comes to cooking and doing it right! I’m not quite that way always though. I made a mess and really should have known better. I impatiently didn’t let my vanilla syrup cool down long enough, though I did cool it some. Well, I went to pour my syrup in the Starbucks container, and lo and behold, I looked and noticed the bottle looked smaller. Up came my syrup gradually, in addition. This happened so fast that it didn’t quite hit me at first what was going on. I didn’t cool the syrup long enough at all. As soon as I realized what was going on, I quickly removed it from the Starbucks bottle and poured it into a big glass Pyrex measuring cup as fast as I could. I wish I could post a picture but either way, I threw away my bottle. When it was all said and done, you would have laughed if you saw the bottle. It had shrunk into HALF the size!! Ha. Now I have go buy a new bottle from Starbucks, just to have to conveniently store my syrup. 🙁 I’ve just for now been storing mine in the same glass measuring cup until I went by Starbucks to get a new one. Hope you all are doing great. You are so sweet! You might not be as clumsy as you think…or you’re giving me too much credit. I’ve to ally done the same thing. I’m going to add that to my instructions. I should have done that earlier. Thanks for the reminder. Good to know the microwave instructions. Really appreciate you adding that information. Glad you love the recipe. That’s a little comforting to know that I’m not the only person who spills things or has these little accidents. Ha. Every time I make this syrup I think of you. :So that means I am thinking of you now while I am making another batch. 🙂 I had to go to Starbucks and get a brand new bottle, but all is well that ends well. I will just make sure that this syrup cools down before I pour it today. Have a wonderful day!! You’re not the only one. 🙂 At least you have one partner in crime. Nice to be thought of too. Adds a smile to my face. I don’t drink coffee. I know…weird! But I love vanilla tea. This is just what I am looking for to flavor plain tea. Thanks! Sounds easy and SWEEET! It should be perfect for you. Enjoy! Oh! Great idea. DIY Vanilla Coke. Wouldn’t have thought of it. Thanks for commenting. I’m pretty sure you could just add hazelnut instead. We use 8 pumps (2 per latte) daily and just go until it runs out. As long as the container starts out clean, it lasts quite a while with no problems. If there is any bacteria in the container of if you let it sit uncovered on the stove too long before transferring it, it will start to taste a bit musty at the end, so just make sure you are not getting anything in the syrup to contaminate it. Hope that helps. Thanks for the great recipe. I am going to try this with Splenda and see if I can make a “sugar free” version. Since I’m already used to the sugar free flavour it shouldn’t be as much of an issue for me, taste wise. I’ll let you know how it goes. Curious though, if the consistency is a little waterier than a typical syrup, have you had to adjust your number of pumps? I like my coffee like a hot caffeinated milkshake (or so said an old friend) so I use 6 pumps in my grande coffee each day (there are 4 pumps in a typical grande). What have you ladies found? I tried it with a fake sugar once and wasn’t a huge fan, but I think I’m more sensitive to fake sugars. Let me know what you think since you are more used to it. To answer your pump question, I started out using the typical 4 pump that you’d find in a typical grande. I actually have cut back recently to make it less sweet at 3 pumps. I do think it is a pump for pump comparison though. I, like you, started out wanting something that really just tasted sweet and yummy. I think my tastes are changing slightly. I really hope this one works for you! Let me know. Hi! I just tried this, but instead of a cup of sugar I tried using honey flavored agave syrup. Agave is natural and doesn’t contain as much sugar which I am trying to keep an eye on! So I just wanted to share an alternative in case anyone else was watching their sugar intake! I just used 1/4 heaping cup of agave syrup with the 1 cup water and let it heat up a bit until it was a smooth consistency. Then i added the vanilla extract. It was super sweet and delicious- without all of the extra sugar! I imagine it is a more watery consistency than if you used regular sugar however. But this worked just fine for me. Thank you so much for sharing your adaptation and providing a natural alternative to this recipe. I’m not into fake sugar, so I am glad you fond the agave based alternative. I really appreciate you taking the time to share this recipe with me and my readers. Blessings on your journey to better health.